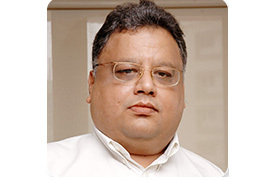 Rakesh Jhunjhunwala is a most popular stock market investor of India. Rakesh Jhunjhunwala is a mastermind in generating a big source of revenue from Indian Stock Market. Stock market portfolio of Rakesh Jhunjhunwala and tips given by him is blindly followed by his fans. The strategy followed by him is the source of inspiration for many investors. Today let us discuss Top 5 Stocks from his portfolio. Titan, Lupin, Crisil, NCC and Rallis India are top 5 stocks from rakesh jhunjhunwala portfolio. Among these Titan, Lupin and Crisil are favorite stocks of rakesh jhunjhunwala. Unfortunately, these stocks were unable to perform in 2015. However, the overall performance of these stocks since purchase is very good. Jhunjhunwala is holding Titan stocks since 2002-03. He bought this stocks at the average price of 5 Rs. He is holding around 8 Cr Titan stocks in his portfolio. As on today stock price of Titan is 382 Rs. Overall CAGR return of this stock from 2002 to 2015 is 39%. In the year 2014 stock was able to generate a return of 60%, however in 2015 stock was unable to generate returns. It is estimated that Titan generated 8272% absolute returns in past 13 years. This means long term investment always pays. Rakesh Jhunjhunwala second largest stock holding is Lupin. He purchased Lupin stock at the price of 150 Rs several years back. He is roughly holding 80 Lac shares of Lupin. Lupin was star performer of 2015. Lupin was able to fetch 28% return in 2015. Overall CAGR return of this stock from the date of purchase is 32%. Absolute returns given by this stock is much higher and in the range of 13855%. CRISIL is next hot favorite stocks of Rakesh Jhunjhunwala. Rakesh Jhunjhunwala holds around 40 lac shares of CRISIL. CRISIL was able to touch life time high level of 2361 Rs. However, this stock was unable to meet expectation and not generated any positive negative returns in 2015. Absolute return generated by CRISIL for Rakesh Jhunjhunwala is 5588%. Rallis India is underperformer stock in his portfolio. This stock gave a negative return of 10% in 2015. Absolute return given by Rallis India in Jhunjhunwala’s portfolio is 655%. NCC is another stock pick by Rakesh Jhunjhunwala. This stock is from construction segment. NCC was unable to generate any return in 2015. However, it was able to touch life time high level of 118 Rs this year. Absolute return generated by NCC since holding year is 704%. First learning from above stock pick is you need to find out stock which are available at low price and having the potential to grow big. I know it is a very difficult task, but you need to master in this task to generate wealth from the stock market. You must be surprised to notice that Rakesh Jhunjhunwala is holding all these stocks for long term 6 years and above. So, learning is bought right and hold tight. You need not sell the stock if fundamental of the company is good. If you carefully observed all stock mentioned above are purchased by RJ at the lower price. So common learning which is known to everyone is Buy Stock at Lower Price and Sell at Higher price. What is your take on these 5 top stocks of RJ? Do you think learning mentioned over here will be helpful to you? Identifying the stocks is the big deal, recently he have vested his interest in the aviation sector and is betting big.. I think its time to eye on aviation industry.